I love family traditions, especially ones involving food. This particular waffle recipe was given to my Dad from a former teacher of his, who also happens to be my god mother. I don't know how she got the recipe, but it has been a favorite of my family's for years. We used to make this breakfast every Sunday morning before church. Now that we are all watching our waistlines a little more, this recipe isn't made quite as often. But this is certainly a go-to recipe of my family's, and if you try it I'm sure it'll be a new go-to for your family as well. Fun Fact: I debuted this recipe on food.com back in 2002. This was the year that my passion for food, cooking, baking, and trying new recipes really took off. 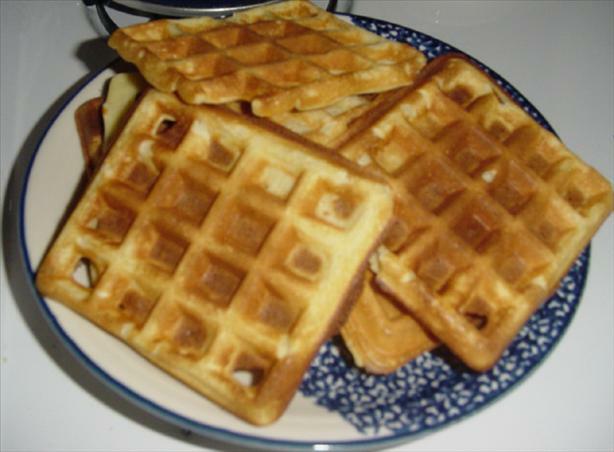 Check out the recipe: Best Ever Waffles. 267 ratings and reviews to date and a rating of 4.5 stars!! Add milk and melted butter to dry ingredient mixture and blend on low speed with an electric mixer. Ladle mixture into hot waffle iron.